After 43 years of operation, the Noble Square Cooperative group decided it was time to upgrade the heating system. High efficiency was a must-have in choosing the best system for the building in order to save on the rising costs of heating, while providing the comforts of heating and hot water to tenants. Leveraging an existing relationship with the owners and working together with Bill Bailey, TEC, as one of three possible bidders for the job, Bailey was able to recalculate Noble Square Cooperative heating loads on a 40+ year old radiant ceiling system and downsized to make price competitive with other designs by using HTP Mod Con condensing commercial boilers. An HTP Mod Con boiler was delivered to a board meeting offering board members a chance to familiarize themselves with the compact design of the boiler. Present at this meeting were 3 TEC and 3 EMCOR employees to ensure that all questions were answered 100 percent of the time. These efforts, along with expert knowledge of the utility rebate program helped secure the job. Noble Square Cooperative offers one & two bedroom units, as well as three bedroom townhouses, for cooperative ownership in Chicago, Ill. With a total of 312 housing units, Noble Square is the current residency for 324 individuals spread throughout 27 floors. Noble Square Cooperative has utilized the original heating equipment installed during the opening in 1969. The original heating system consisted of two commercial mid efficiency boilers estimated run at about 65 percent efficiency with an input of 7,625,000 BTU each. A single boiler with a BTU input of 4,320,000 provided domestic hot water to the housing unit through an instantaneous heat exchanger. In order to replace the existing system, the new system design would have to handle the current load for the domestic hot water, radiant ceiling and make-up air systems. 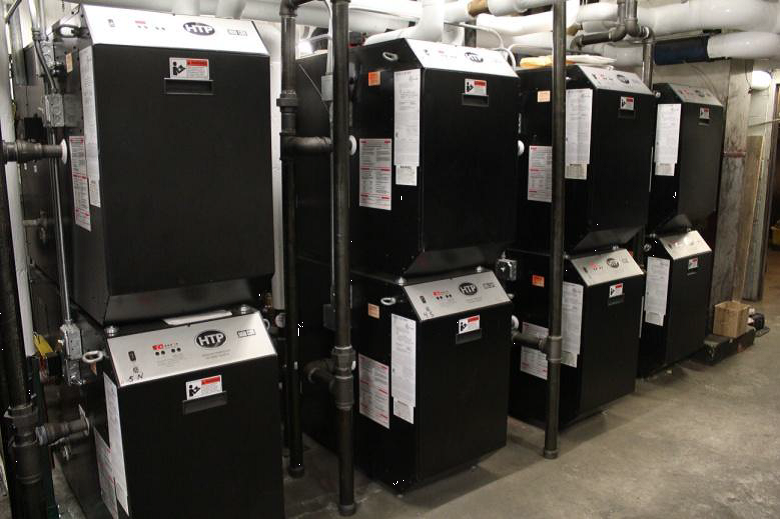 In order to save on heating costs, the system was replaced by 16 Mod Con boilers and volume water heater units total, operating at 94 percent efficiency and 850 thousand BTU each, totaling 13.6 million BTU. 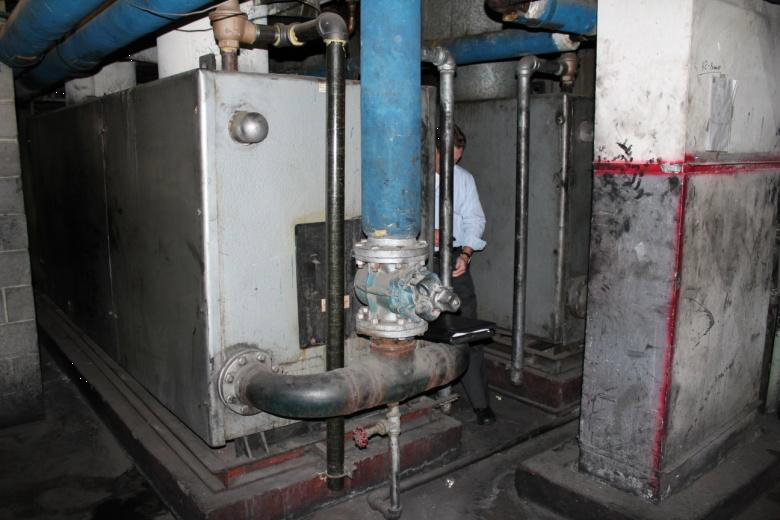 Ten Mod Con units were designated to operate in banks of 5 boilers, each bank with its own master boiler. The banks were split to serve heat to the northern and southern regions of the building. The make-up air system utilizes operation of two of the Mod Con boilers, while four Mod Con Volume Water Heaters work together with two 175 gal. ASME storage tanks in order to provide domestic hot water. The new HTP Mod Con boilers have been in service since installation on May 31, 2011. From the very beginning Noble Square Cooperative noticed an exponential difference in their heating bills, especially as they entered into the colder winter months. Energy savings prior to installation were projected at approximately 20 percent or $68,400 per year. After careful project savings analysis it was determined that the 16 HTP Mod Con 850 boilers and volume water heaters saved much more than that. Savings for the property totaled $103,727.59, totaling 32 percent during the first year of operation. With an installation cost of $648,300 including manual labor, parts and materials, and a $50,000 People Gas Utility Rebate pay back will be achieved in just about seven years time. HTP Mod Con Boilers are made in America in a manufacturing plant located in East Freetown, Mass. Founded in 1974, HTP strive to make the most efficient, user friendly products in the market today. “We don’t make conventional products, so our time and energies are not spread over a broad range of unrelated items. High efficiency is all we do and all we care about. That, in turn, better enables us to help our customers climb the learning curve and endure the growing pains these products inevitably demand,” said owner Dave Davis, a statement that proves to hold true through the savings found at Noble Square Cooperative.